320 pages | 80 Color Illus. | 128 B/W Illus. More than half of the world population now lives in cities, and urban expansion continues as rural people move to cities. This results in the loss of land for other purposes, particularly soil for agriculture and drainage. This book presents a review of current knowledge of the extension and projected expansion of urban areas at a global scale. 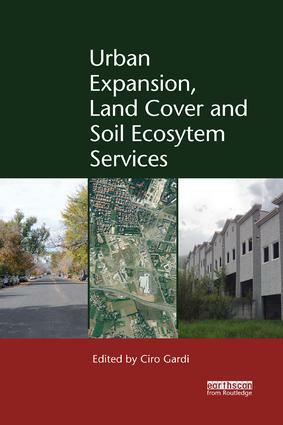 Focusing on the impact of the process of 'land take' on soil resources and the ecosystem services that they provide, it describes approaches and methodologies for detecting and measuring urban areas, based mainly on remote sensing, together with a review of models and projected data on urban expansion. The most innovative aspect includes an analysis of the drivers and especially the impacts of soil sealing and land take on ecosystem services, including agriculture and food security, biodiversity, hydrology, climate and landscape. Case studies of cities from Europe, China and Latin America are included. The aim is not only to present and analyse this important environmental challenge, but also to propose and discuss solutions for the limitation, mitigation and compensation of this process. 1. Is Urban Expansion a Problem? Ciro Gardi works in the Animal and Plant Health Unit of the European Food Safety Authority, Parma, Italy. Previously, he was a Senior Scientist at the Land Resource Management Unit of the Joint Research Center of the European Commission and Professor of Soil Science at the University of Parma. He has served as an independent expert and consultant for the European Commission, World Bank, OECD and several NGOs and is currently a member of the Scientific Advisory Committee of the Global Soil Biodiversity Initiative, representing it in the Global Soil Partnership (FAO).